Steve Miller was an Indian Wars reenactor off and on for some 20+ years during his Air Force career. He has also been a board wargamer, primarily WWII but with 8 or 9 Civil War titles in his collection. Another of his interests is the Old West. Back in the early 1960s he borrowed Dee Brown’s “Fort Phil Kearny, an American Saga” as a book from his high school library. He also built a small perhaps 24 inch by 18 “cavalry fort” and “manned” it with HO scale Thomas figures purchased from K+L of Tulsa, Oklahoma, and with AirFix plastic Indians. When he was commissioned as a 2Lt in the Air Force in 1968 and left for active duty, both the fort and the miniatures were left at his parents’ home. Over time they disposed of all of them. 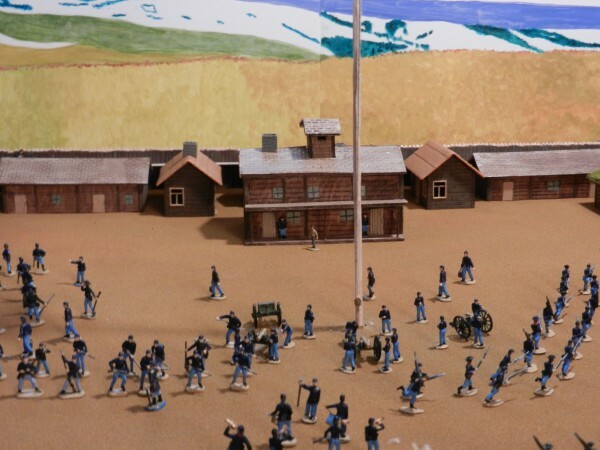 Years later, Steve began Indian Wars reenacting in Tucson, San Antonio, and finally southern California, but never thought much about his boyhood diorama until this past January. 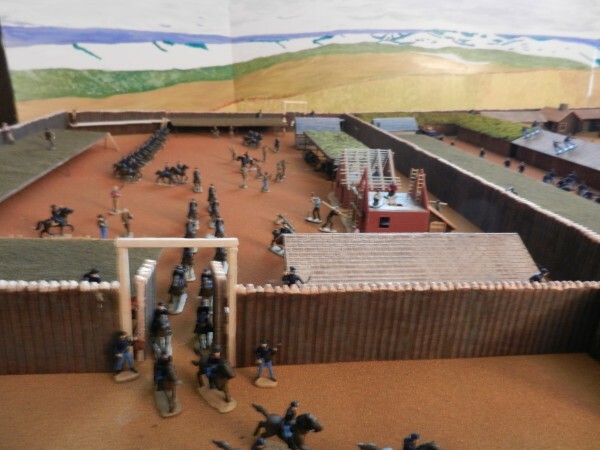 He re-read Dee Brown’s book about Fort Phil Kearny again,inspiring him to try to build another diorama. He had taken Terry Johnson’s “Northern Plains Indian Wars Tour” in about 1999 which included a visit to the Fort Phil Kearny HIstorical Site outside of Sheridan, WY. That museum contained a diorama. Steve googled Ft Phil Kearny, found its web page, and saw a picture of that diorama and a note showing that it had been created by Bob Wilson, once the site superintendent but since retired. Steve was able to contact Mr. Wilson, compare notes, learn of some of the factual errors in Dee Brown’s old book, and begin planning his own diorama. As for the layout of the post, “MIlitary Posts of the Powder River” was the most useful. In it and in “Red Cloud’s War” Steve Miller learned that the fort was much larger that what was mentioned in Brown’s book (400 ft by 400 ft). It turns out that was the size of just the parade ground. The actual size of the “main” fort was 800 feet by 600 feet, and attached to that was the Quartermaster Yard of 600 feet by 250 feet. At a 1/72 scale, he was going to need a table 20 feet long and 8 feet wide. Oops, he didn’t happen to have a room that would accommodate that. What to do? Fort Phil Kearny was founded in July 1866 by Col Henry B Carrington and four companies of the 18th U.S. Infantry about 150 miles northwest of Ft Laramie, Dakota Territory in what is now north central Wyoming. It was located on the eastern slopes of the Big Horn Mountains in what was the heart of the Sioux. Its purpose was to protect travelers over the Bozeman Trail to the gold fields of Western Montana. And its founding led almost immediately to what became known as Red Cloud’s War. Col Carrington personally designed Fort Phil Kearny down to its tiniest detail and closely supervised its construction throughout the late summer and fall of 1866. By the beginning of December, the palisade was completed and most of the 25+ buildings in the fort were completed or nearing completion. Almost 30,000 logs had been cut and transported by wagon to the fort, a distance of about 6 miles. By early December, the fort had been reinforced by one 64-man company of the 2nd U.S. Cavalry and a fifth infantry company, bringing military strength up to about 420 men. In addition, the were about 150 civilians there, some government employee, some contractor personnel and some just waiting to move up the Bozeman to Montana or back south toward Ft Laramie and points east. On the morning of December 6th, Col Carrington dispatched to wood train to bring in yet another load of timber from the pinery, a heavily forested area of lodgepole pines about 6 miles northwest of the fort to help complete the construction of the last 6 or 8 buildings yet to be completed. A party of Sioux warriors attached the wood train, a common occurrence. Instead of sending out a single detail to relieve the wood train and see it safely to the pinery, Col Carrington decided to send out two details, one to drive off the Sioux, and a second, commander by himself to circle around and be positioned to ambush the Sioux as they retreated from the first detail which was commanded by Captain William J. Fetterman, recently arrived at the fort from recruiting duty. 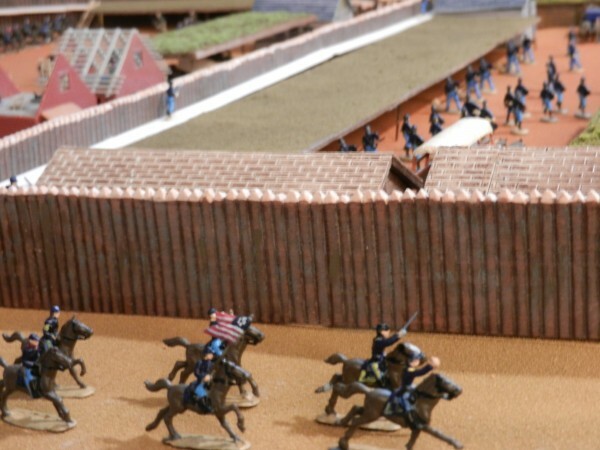 This diorama depicts the scene as the first of these two details, the one commanded by Capt Fetterman and consisting of about 30 cavalry troopers under Lt H. S. Bingham is departing the fort through the Quartermaster Yard (QMY) gate. Col Carrington is near the center of the QMY on the black horse and is directing Lt Grummond to move their detachment of 24 mounted infantry out that gate as soon as the cavalrymen are through it. Meanwhile the guards on the ramparts or banquette as Col Carrington referred to it are being augmented by addition infantrymen from the two guard reliefs for the day. Also, infantrymen detailed as artillery crews are manning the 3 mountain howitzers and the one 12-pounder field howitzers for possible action while the regimental band in front of the adjutant’s office plays a tune. 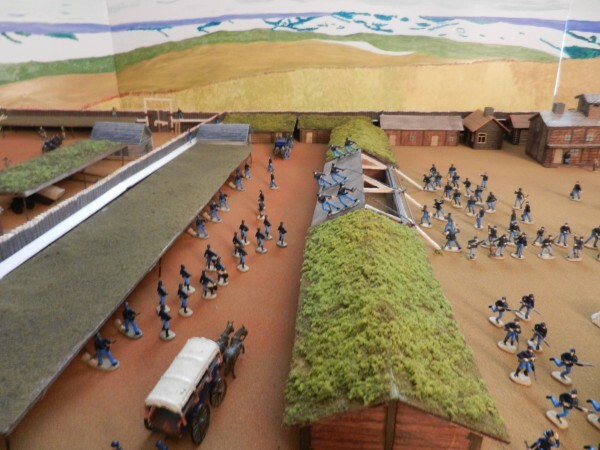 The attack on the wood train is an attempt by the Sioux under Red Cloud to lure a sizeable group of soldiers away from the fort’s cannons (which the Sioux have great respect for/fear of.) The army hopes to trap the attackers between the two mounted army details. Both sides will fail to accomplish their objectives today, but the stage will be set for another such attempt just 15 days hence, the result of which will become known as the Fetterman Massacre. Once I had decided on making a diorama of Fort Phil Kearny, the first question to be addressed was to be choice of scale. 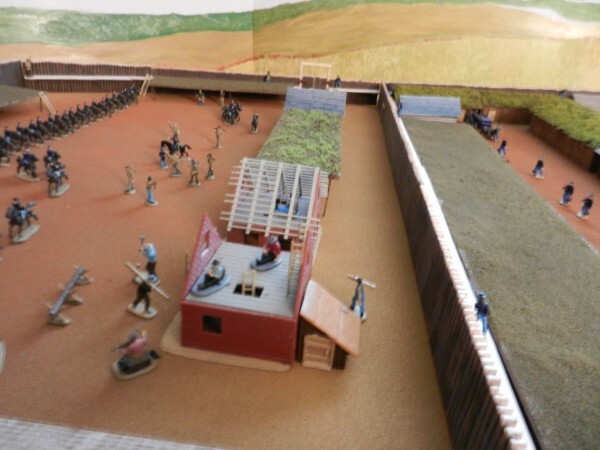 I had only made one diorama in my life; that was of a “generic” Indian Wars fort way back in the early 1960’s while in high school. I remembered that the metal (ie, lead) figures I had used were in HO scale, and about an inch high. Armed with that information, I embarked in a long search on the internet. I could find many makers of American Civil War (ACW) plastic figures in 1/72 scale, but virtually nothing in that scale in metal. After a wild-goose chase after Jack Scruby figures, I found a web page for Scruby’s, but the figures didn’t look quite right. An English gentleman on the Colonial Wars Yahoo Group site mentioned that they might have been Jim Thomas figures sold by a K+L company in Tulsa, OK. Somehow, that just rang a bell, but could that company still be in business 50 years later? A Google search of Thomas figures led me to an article by Scott Mingus, and one look at his figures told me that I was on the right track. More searching finally yielded a phone number for K+L. When I called, I found out that the owner had just died last December. However, his wife said she would send me a catalog and she would try to fill my order out of existing stocks of their ACW figures. When I saw the catalog, it hadn’t changed much in those 50 years. Yes, prices were higher, but still very reasonable (dismounted figures ran 30-50 cents each with mounted figures ranging from 80 cents to a dollar. I ordered and received about 80 mounted figures and 100 infantry figures from her. However, when I tried to place a third order, I was told that she is closing the business. I sincerely hope she will find a buyer for the molds as the Thomas line is just too good to let die. But I digress. Having found a source for the Thomas figures, I set about purchasing some plastic 1/72 sets on eBay to “flesh out” the diorama. I purchased ACW infantry sets from Air Fix and Imex, Engineers (Pioneers) from Revell, frontiersmen from Imex and AirFix, and Artillery from Imex, mostly on eBay, but I also bought 3 Imex sets at Hobby Lobby, (Wagon Train, Lewis and Clark, and ACW Union and Confederate Infantry). I’ve also purchased several sets of Sioux Indians by Airfix and other makers for use in a follow-on diorama of Fort Phil Kearny. 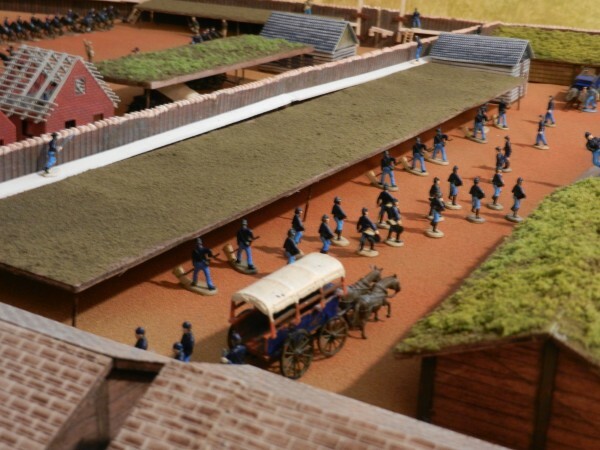 Once I had selected the scale of the figures I would be using for the troops and civilians, that obviously fixed the scale of the fort and its buildings. In my first reading of Dee Brown’s “Fort Phil Kearny: An American Saga”, I had misinterpreted the size of this fort (as I later found that Brown did also.) He refers to both the size of the fort and of its parade ground as being 400 feet by 400 feet. While that was indeed the size of the parade ground, the fort was actually much, much bigger. When the attached Quartermaster Yard is also included, the fort measures 1400 feet by 600 feet. When I finally realized that, I calculated that at HO scale the fort would measure some 17 feet by 7.5 feet. Unfortunately, my available space to work with was just 6 feet by 4 feet so some serious compromising was going to need to be done. I decided to devote the majority of the available space to the main fort which was built by the soldiers and I would include all of the buildings that were situated there, albeit at somewhat reduced size. Generally each of the building in this portion of the fort is roughly the correct depth and height and is about 2/3s as long as the original. The QM yard which was built entirely by civilians (government employees and contracted personnel) has been shortened to about one-third of its original length but most of what has been eliminated was devoted to a huge hay storage area and long mule stables. My next decision was how to make the stockade walls. One option would have been to make the individual logs and stick them into whatever ground material I would use. I soon discarded this approach as impractical. I finally settled on using two inch high strips of 3/16 inch basswood. Each strip as notched and grooved every 0.2 inches to give the pointed log effect, then wood stained and finally dry brushed with grey to give a bark effect. A half inch wide banquette (or more commonly called a parapet today) was wood-glued to the inside face of the palisade wall. At opposite corners of the main fort, I built two open bastions. I had originally intended for these to be enclosed blockhouses such as you usually see in westerns, but learned that, at least at Fort Phil Kearny, Col Carrington chose open bastions. Most of the buildings I hand built from scratch, again using 3/16 or 1/8 inch bass wood. Most of the roofs were made of 1/8 inch bass wood and topped with a plastic shingle product that I purchased from Hobby Lobby. However, all of the barracks and at least two of the storage buildings had sod roofs. For these I again used a thin sheet of bass wood, but then sprayed a coat of Scenic Cement over it, and sprinkled a coat of Woodland Scenics Fine Turf Earth and then Grass over the cement to give the sod look. Eight of the buildings are not scratch-build. These I purchased on eBay. Four of these are plastic “Russian peasant huts” from Pegasus that I used for the temporary Officer’s quarters that were hurried “thrown together” as winter approached in November of 1866, The other 4 were purchased used on eBay and are of unknown make. These are the four buildings that are in various stages of construction. The backdrop scene I hand painted using several photographs of the Big Horn Mountains in winter looking west from the fort. At the date of this scene (December 6th) those mountains were snow-covered, but the area right around the fort was lacking snow. The clouds were hanging low over the mountains that day, and that is the look I’ve tried to convey in the painting. From the time I finished reading Dee Brown’s book on Phil Kearny in late January of this year, it took me about six months to complete the scene shown in the pictures for this article. By October I hope to begin painting the rest of my soldier figures and all of my Sioux figures and begin putting together my next FPK diorama scene, that of an attack on the fort by the Sioux, something which in actuality did not occur. Toby, I’m sorry but I just saw your comments over a year later on Nov 26, 2016. I probably have all of the Thomas figures I will ever need now (about 500), most of them acquired over eBay. There is a market for them if they are Thomas figures. If you see this and can send via email a picture(s) of some of your figures I can tell you if they are, in fact, Thomas. Generally on eBay infantry figures sell for between 50 and 75 cents each while mounted cavalry sell for between 75 cents and $1.10, with painted ones selling for a bit more. I am in contact with at least two other gentlemen that collect and use Thomas figures for dioramas. My email is stevemill2@aol.com if you would like to contact me directly.